I’ve just stumbled across a nice personal website for Broadstairs, www.stella-maris.org.uk/Broadstairs.shtml . Not updated on a regular basis, it does feature a useful local history page, links and news on local events. It also has local weather and some nice photos, which I'm rather disappointed to see are copyrighted and chargeable rather than available for all to share freely under the same type of non-commercial Creative Commons license available for the photos you can find in the Thanet Life archive. 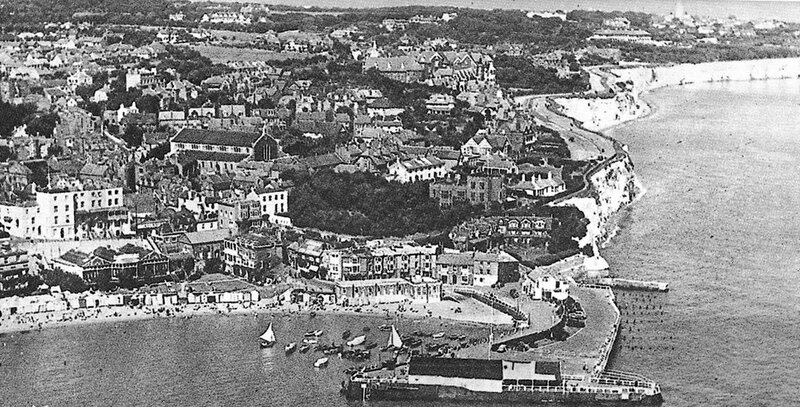 So I have to use one of my own photos as an illustration instead, Broadstairs in 1938. I assume the Website title comes from the song "Broadstairs, Star of the Sea, that we used to sing as children once upon a time at the Charles Dickens School? Certainly worth a quick interest visit. Just thought I should point out two things. First it is updated whenever I have anything to say! The other is that the photos are available to buy as a print, anyone wishing to use them for non-commercial purposes just has to ask. As a photographer I always retain copyright of all my work, I have had it copied for commercial purposes without permission before and will always chase that up. I guess it's a question then of whether photos are placed online "pro bono" or whether they might contain a commercial proposition. The CC license does make it easier in regard to copyright and of course saves people having to ask and in seventy years time (I think) before it expires, track down one's living relations to ask permission. Sadly the copyright legislation in regard to the internet is a bit of a shambles these days and the European Copyright Directive has made it into a complete dog's dinner of exceptions. Its a very good site. Certainly worth adding to my Favorites list! Thanks for letting us know about the site.